Characteristics, Location, Discovery of Russian Prehistoric Statuettes. 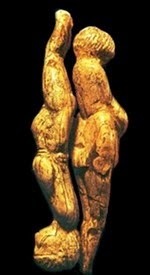 (2) One of the Double Venus figures.  For the earliest sculpture, see: Oldest Stone Age Art: Top 100 Works.  See also: Russian Art (c.22,000 BCE - 1920). The Avdeevo Venuses exemplify prehistoric sculpture in the European heartland of Russia, during the period of Gravettian art (25,000-20,000 BCE). Along with the Venus of Kostenky (22,000 BCE) and the Venus of Gagarino (20,000 BCE) they form a centre of Paleolithic art, within the Kursk-Voronezh-Lipetsk triangle. Although they belong to the wider European tradition of venus figurines, the Avdeevo sculptures depict mature women in different phases of the reproductive cycle, who (overall) are somewhat less obese and less well defined than such archetypal figures as the Venus of Willendorf (25,000 BCE), or the Venus of Moravany (24,000 BCE). This is a relative difference only. 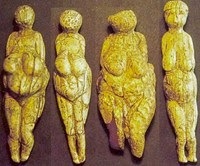 Indeed, the central-Russian tradition - as illustrated by the Kostenky-Avdeevo-Gagarino sites - appears to have two venus paradigms: one fat, and one thin - with the Avdeevo figurines inclining to the latter. A more significant difference, perhaps, between the Russian and non-Russian venuses, is that the genitalia of the former are less exaggerated. If, as believed, venus figurines were fertility symbols that embodied the mysteries of childbirth, Russian Stone Age artists clearly leaned towards a different representation of this than their counterparts in central and western Europe. For the chronology of ancient art in Russia and the rest of the world, please see: Prehistoric Art Timeline (from 2.5 million BCE). For details of contemporary parietal works, see: Cave Art (40,000-10,000 BCE). There are two archeological sites at Avdeevo from which a variety of prehistoric art has been recovered - chiefly figurines. The sites are known as "Avdeevo-Old" (Avd-I), and "Avdeevo-New" (Avd-II) and, at both, human occupation dates back to about 20,000 BCE. The two sites, some 20 kilometres apart, are situated at the confluence of the river Sejm and its tributary, the Rogozna, not far from the city of Kursk, in central Russia. They were discovered in 1941, and excavated immediately after the war: first, by M.V.Voevodskij in 1946, then by A.N.Rogachev in 1949. During the mid-70s, new excavations were conducted by a team of archeologists from the Museum of Anthropology of Moscow State University (led by Mariana Gvozdover) and the Leningrad Institute of Archeology (led by G.P.Grigorev). The 'archeological site' of Avdeevo contains two oval living areas, each set within a network of semi-subterranean lodges and pits. The living area at Avdeevo-I is roughly twice the size of that at Avdeevo II. The archeological floor layer is, in parts, dyed red from ochre pigments (Avdeevo-I) or black from charcoal (Adeevo II). Stone and bone tools found at Avdeevo, include Kostenky-type knives, shouldered points, bone awls, burnishers and shovels, along with a series of functional objects with anthropomorphic or zoomorphic 'heads', mostly associated with the sculptural representation of female humans and animals. Carbon-dating shows that both sites were inhabited by 'modern man' from at least 20,000 BCE, although some artifacts have been unearthed which date back to 27,000 BCE. In respect of their overall physical structure and organisation, assemblages of stone tools, range of statuettes, and items of personal adornment like bracelets and beads, the Avdeevo sites are closely connected with the sites at Kostenky - located on the Sozh River, near Voronezh, some 200 miles to the east - notably Kostenky I, XIII and XVII. For an example of Paleolithic Russian cave painting, please see the: Kapova Cave Paintings (12,500 BCE) in the Shulgan-Tash Preserve. For more art from the Russian interior, see: Amur River Basin Pottery (from 14,300 BCE). The Stone Age art found at Avdeevo consists almost entirely of mobiliary art, notably venus figurines and ivory carvings of woolly mammoths. (See also the German Ivory Carvings of the Swabian Jura.) Most of these sculptures were carved from mammoth ivory, reindeer horns and animal bones, but scientists also found some stone sculpture carved from soft rock (marl, sandstone, shale, limestone). In addition, a large quantity of cylindrical beads were discovered, made from the teeth of arctic wolves and foxes. However, no pictographs or petroglyphs were found. Discovered at Old Avdeevo, this unsmoothed rather primitive ivory statuette is 14.5 centimetres in height, and up to 5 centimetres in width. It depicts a female with quite narrow shoulders but a wide pelvis, though without excessive fat. It has no legs and the pelvis tapers into an extended triangle. Looks unfinished. Recovered from Old Avdeevo, this partially smoothed ivory figurine is 12.5 centimetres in height, and up to 3.6 centimetres wide. It has slightly drooping shoulders, arms bent at the elbow, indistinct breasts, a flat abdomen, realistic buttocks and stout legs. Genitalia are not highlighted. Looks chunky and unfinished. Discovered at Old Avdeevo, this unfinished ivory carving is 8 centimetres tall and up to 4 centimetres in width. It has a large head, prominent arms, a protruding upper breast/abdomen, steep hips and narrow legs carved in a trapezoid plane. Found at New Avdeevo, this large, upright ivory figure stands roughly 21 centimetres in height and up to 6 centimetres in width. The shoulders are as wide as the hips, there are no breasts, the abdomen is flat, and leads into an elongated pubic triangle. The overall posture differs from that of the female figurines, notably in the arrangement of the arms, and the pubic area, indicating that this is probably a male figure. Actually, its head is almost zoomorphic. Recovered from Old Avdeevo, this smoothed ivory statuette is 16 centimetres tall and up to 3 centimetres wide. Depicting a tall, slender woman, who is not pregnant, it has very flat buttocks and small lower legs. The excessively elongated torso, topped with a rounded head, has narrow drooping shoulders, indistinct arms, sagging, pendulous breasts, a wide pelvis and flat abdomen, leading to the pubic triangle. Legs appear separately down to the knee. Discovered at New Avdeevo, this ivory figurine stands 9.5 centimetres tall, and is 3 centimetres at its widest point, the pelvis. It portrays a mature, pregnant woman with a slim torso and legs but huge breasts, severely protruding belly and extremely obese buttocks. The head and face area are decorated with a wedge-shaped pattern, the arms are prominent at the top, but indistinct thereafter, although the hands are shown complete with fingers and bracelets. The figure maintains its detail below fat hips and protruding belly. Figurine No 6, along with Figurine No 9, is the closest to the Russian "fat" paradigm. Taken from New Avdeevo, this ivory carving is 10 centimetres tall and up to 2 centimetres wide, at the pelvis. Its head has a detailed coiffure, or cap, and it has drooping shoulders, a flat chest, drooping breasts, hands with fingers and bracelet. It has a slightly swollen belly and flat buttocks. Its uniqueness lies in the detail of its hair and facial features, including nose and eyes. Overall, perhaps the closest to the Russian "thin" paradigm. Discovered at New Avdeevo, this ivory figure is 9.5 centimetres tall and up to 2.3 centimetres wide. It has a tilted head with hair, drooping shoulders, excessively drooping breasts, a keel-shaped abdomen. Its dominant feature, aside from the breasts, is a fat middle (hips and torso), but it has delicate features including fingers and bracelets on the hands. Found in Old Avdeevo, this ivory figurine has Willendorf-style breasts, an obese middle and obese thighs. It is 9 centimetres tall and up to 3 centimetres wide. Its legs are missing below the knees. It has a head with an unfinished type of coiffure or face, narrow shoulders and wide hips. More primitive, more uneven and less finished than No 6, but equally obese. Recovered from New Avdeevo, this ivory fragment of a female torso (from the shoulders to the pubic area) was reassembled from two smaller pieces. It is 8 centimetres tall and up to 9 centimetres wide. Archeologists estimate that the original figurine measured some 20 centimetres in height. As reassembled it has massive teardrop-shaped breasts, below which are forearms, and hands with fingers and bracelets. The rounded belly protrudes forward. In addition, like Kostenky, the Avdeevo site yielded a quantity of rock art, namely fragments from a number of female figurines caved out of chalk, marl and other soft stone. For another exceptional example of Stone Age sculpture from Russia, see the Shigir Idol (7,500 BCE), the oldest surviving wood carving. Here is a short list of the most celebrated venus statuettes from the Upper Paleolithic, carved outside Russia. - Venus of Hohle Fels (ivory) (35,500 BCE) Germany. - Venus of Galgenberg (steatite) (30,000 BCE) Lower Austria. - Venus of Dolni Vestonice (baked clay) (26,000 BCE) Czech Republic. - Venus of Willendorf (limestone) (25,000 BCE) Lower Austria. - Venus of Monpazier (limonite) (25,000 BCE) France. - Venus of Moravany (ivory) (24,000 BCE) Slovakia. - Venus of Brassempouy (ivory head) (23,000 BCE) France. - Venus of Laussel (limestone low-relief) (23,000 BCE) France. - Venus of Lespugue (ivory) (23,000 BCE) France.  For more about parietal art, see: Cave Painting (40,000-10,000 BCE).  For more about rock carving, see: Rock Engravings. We gratefully acknowledge the use of material from "Art of the Mammoth Hunters" (1995) by Professor Mariana D. Gvozdover, one of the lead archeologists at Avdeevo.  For more information about Russian prehistoric sculpture, see: Homepage.